The Virginia Tea Company has provided me with Winter Cheer for the purposes of providing an honest review. I received this product at no charge to me and received no other compensation. 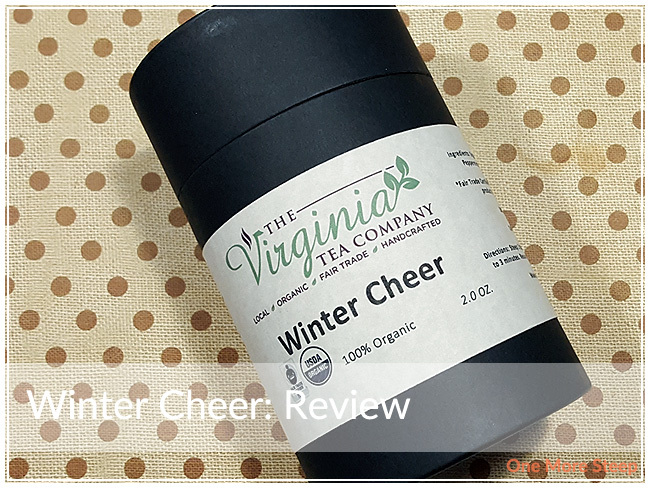 Winter Cheer came in a cardboard carton, but unlike the other teas from The Virginia Tea Company that I’ve reviewed so far, this one came preportioned in tea bags. 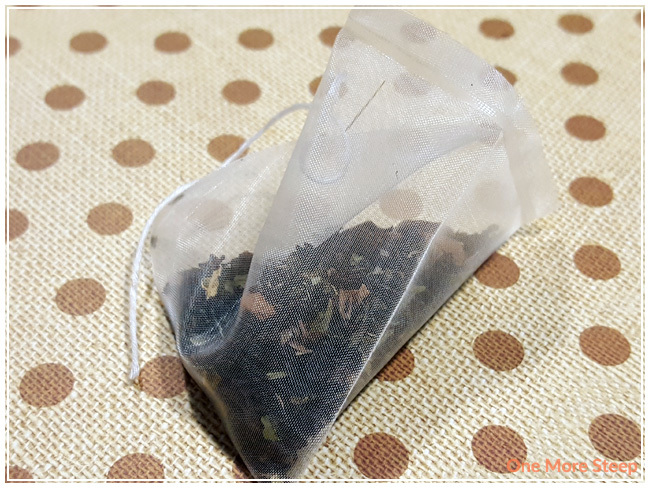 Another option that they offer, this one is 2oz of tea in 20 pyramid tea bags for $15.00USD. For ease of seeing the tea itself, I cut open the tea bags to get a better look at the tea. There’s a strong smell of peppermint and cinnamon in this tea blend, I quite like it. The smell of peppermint and cinnamon both remind me of the holidays. It may be March, but it snowed this past week where I live, so it still feels like winter! 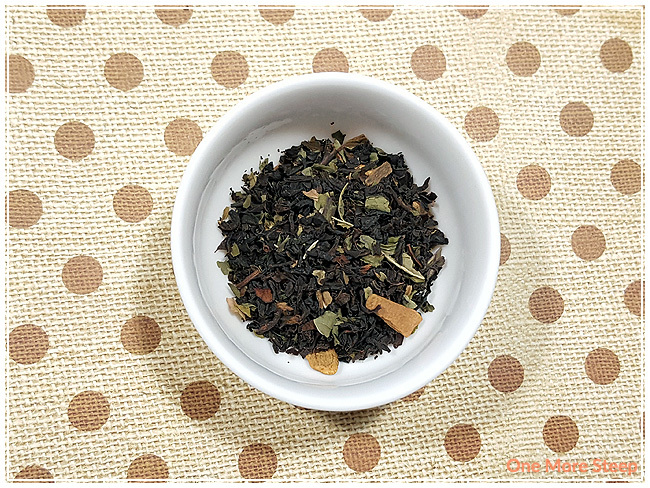 It’s very easy to see all of the ingredients: black tea, peppermint, and cinnamon. As per the product page, all of the ingredients are organic. This tea is 66% fair trade and 100% organic, which is quite nice to learn! I like knowing that the people who helped to produce the tea are being paid a living wage for their area. The Virginia Tea Company recommends steeping Winter Cheer in boiling water (100°C/212°F) for 2 to 3 minutes. I steeped it for 2 minutes for the initial steep. They suggest that the tea leaves can be resteeped up to 3 times. Winter Cheer steeps to a clear reddish orange liquor. There’s a strong peppermint smell to it that’s quite inviting. 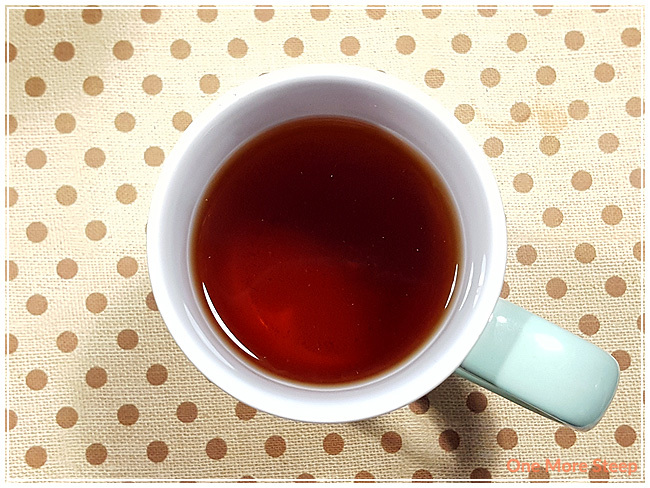 On first sip, I can make out the black tea base – it has wonderful malty notes to it. The cinnamon is warming, and it provides a light amount of sweetness to the tea. The peppermint offers a minty freshness with each sip that reminds me of candy canes during the holidays. It’s been a while since I’ve had a tea blend where I could make out each individual flavour, it’s quite nice to be able to do that and taste how well balanced the flavours are! They complement each other nicely. Because it was suggested that the tea leaves could be resteeped up to three times, I had to give it a go – and three resteeps was right on money. 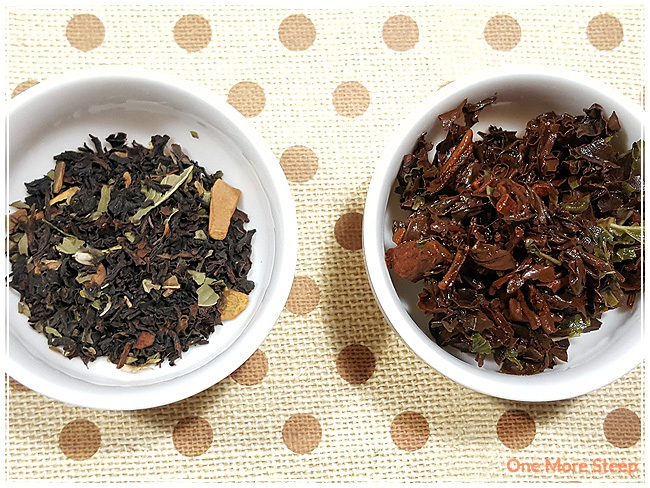 The mint and cinnamon flavours were still present by the third resteep, they were just a bit weaker. I think the flavours would be more muddled if I had attempted a fourth resteep. I added 30 seconds for each additional resteep. I loved The Virginia Tea Company’s Winter Cheer. It may seem like the wrong month for it, but the crazy amount of snow I’ve been experiencing lately has gotten me into a bit of a sour mood so a cup of Winter Cheer suited me just fine as a pick-me-up. I found the flavours of all three ingredients to be well balanced in creating an enjoyable flavour. The fact the tea leaves can be resteeped up to three times is quite nice, the flavours are still present – just getting a smidgen weaker.